Departs from just in front of the drying room, ........takes a quick drive 2 minute drive ...................................... from our hotel and drops you at the Furano Ropeway. North Country Inn is only a few minutes ride to the Furano Zone. The shuttle runs continuously from 8.15am so all our guests can ride the first Furano Zone Ropeway at 830am each day. Shuttle Bus Timetable. click for pdf. All North Country Guests have the luxury of a wireless network in our Lounge and Bar area. This is a complimentary service and all guests are welcome to access this network with their own personal computers. Alternatively, we also have a complimentary desktop computer with internet access for guest use. This is a faboulous service which allows you access to Japanese Yen right here at your accommdation. 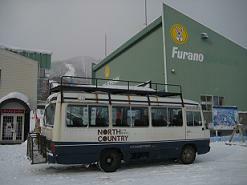 North Country is the first foreign exchange provider for the Furano ski area.